We tend to think there’s nothing much to be done to the lawn in January but if the weather is mild it’s a good time to repair bumps and hollows by making cuts in an H shape in the turf with a spade. Peel back the grass and fill the hollow with loam or remove what’s causing a bump. Press the turf back into place bringing the cut edges together. If there is an area needing a larger repair you can lay a new turf, but again only do this if the weather is mild. If it’s frosty, needless to say, keep off the lawn if you can. Walking on it causes ‘frost burn’ which may leave blackened foot impressions on the surface. In dry weather generally tidying up edges with an edging tool or edging shears is another job well done. Picking out weeds each time you see them is a help towards having a weed-free lawn come spring, without the need for herbicide. Dog urine can be a problem at this time of the year, with the grass being relatively dormant. It’s a bit tedious but watering the area is an effective remedy. Spiking the lawn with a garden fork will help relieve waterlogging if this occurs. Fill the holes with a mix of sharp sand and loam. Look for any signs of disease such as Fusarium patch so you can prepare to deal with it by ensuring the lawn drains efficiently and avoid using early Spring fertiliser. When you can, reduce thatch by scarifying the grass and then aerating. A fungicide can be used to treat the area once the weather becomes warmer. 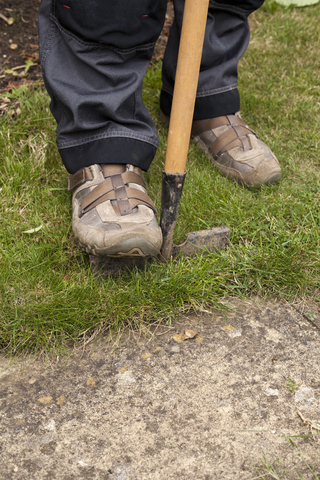 Remove mole hill soil, any winter debris that has accumulated on the lawn and brush away worm casts and you’re pretty well done for the day. It won’t be long before we’re out there mowing again.